If you’re the type of person that loves to go “off the beaten path” or, “take the road less traveled”, it’s time that you get in on the Caribbean’s wild side. Although many people think of quiet beaches, coconut drinks, and Soca when they think of the Caribbean, there’s so much more to it! The many island countries that lie in the Caribbean Sea offer so much more than just beach-basking. You’ll be surprised to find out just how many truly unusual things there are to do in Paradise. Read on to discover 6 unique activities to do in the Caribbean! Swimming with pigs? That’s probably not what you’d normally expect to be in the water at a beach in the Bahamas. Although the creatures aren’t native islanders, they’ve made Big Major Cay, a tiny island in the Exuma district, their permanent home. There are plenty of theories about how these hooved mammals ended up on what has now been dubbed “Pig Beach”. Some say they were shipwrecked, others say they were left there by pirates. However, a Bahamian farmer named Wayde Nixon has gone on the record saying that he brought them there in the late 1990s. He has said that they were meant to be a sustainable supply of food, in case theories that the year 2000 would cause a worldwide computer crisis came true. 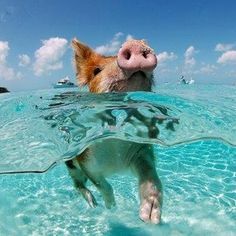 In any case, although the Bahamian government has recently barred tourists from feeding the pigs in order to protect them, you can still pay a visit to the friendly swimmers by booking a boat tour or renting a boat on your own. Big Major Cay is an uninhabited island, so make sure you bring any food and water (for yourself, not the pigs!) that you might need during your excursion. A mystical journey through Harrison’s Cave. 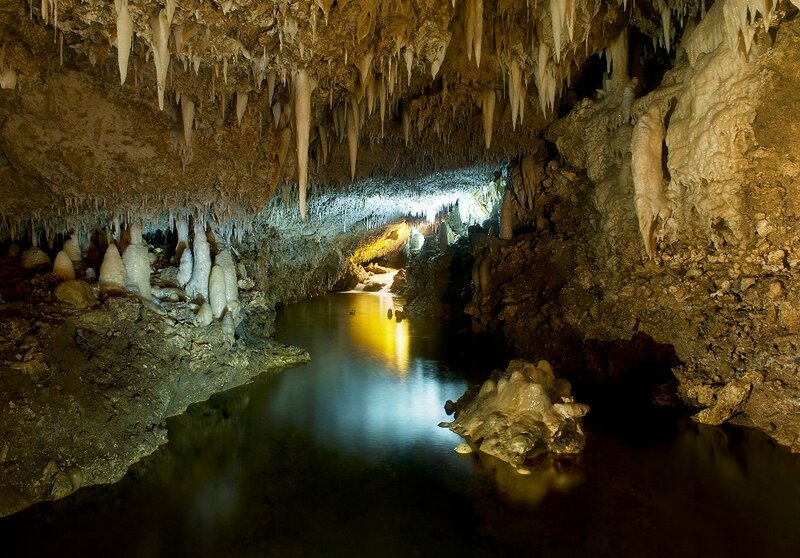 Harrison’s Cave is a must-see if you’re ever in Barbados. Although many of the islands surrounding it are volcanic, Barbados is a coral-capped limestone island. There are only a few of those in the entire Caribbean. Since the limestone filters underground water, Barbadians enjoy some of the best naturally-filtered H2O on the planet. It’s also the reason why caverns like Harrison’s Cave exist, since the water flows through the porous Karst rocks to create them. There are two ways to experience this natural attraction: a low-key ride through the tunnels on a tram, and an adventurous hiking/swimming excursion for which you’ll need some special gear. Be warned, though– it’s not for the faint of heart. While hiking, you’ll make your way among towering columns and flowing streams. No doubt you’ll end up in awe over the natural beauty of this underground world. As you gaze at sparkling stones and wonder at the spectacular geological formations, you’ll understand why many Barbadians refer to Harrison’s Cave as “the 8th wonder of the world”. Here’s an unusual Caribbean activity that looks like a cross between moonwalking astronauts and snorkeling: Sea Trek. There’s no training needed: simply place the odd-looking helmet on your head and walk along the ocean floor! You’ll get to view all the colorful fish and sea creatures from the comfort of an oxygen-filled mask that envelopes your entire head. This activity is perfect for those who would rather walk than swim, or who simply want to try something different for a change. It’s even accessible for people who use wheelchairs. You can try Sea Trek on several Caribbean islands, including St. Maarten and the Bahamas. Check out the Sea Trek official website for more information. Pekelmeer Flamingo Sanctuary in Bonaire. 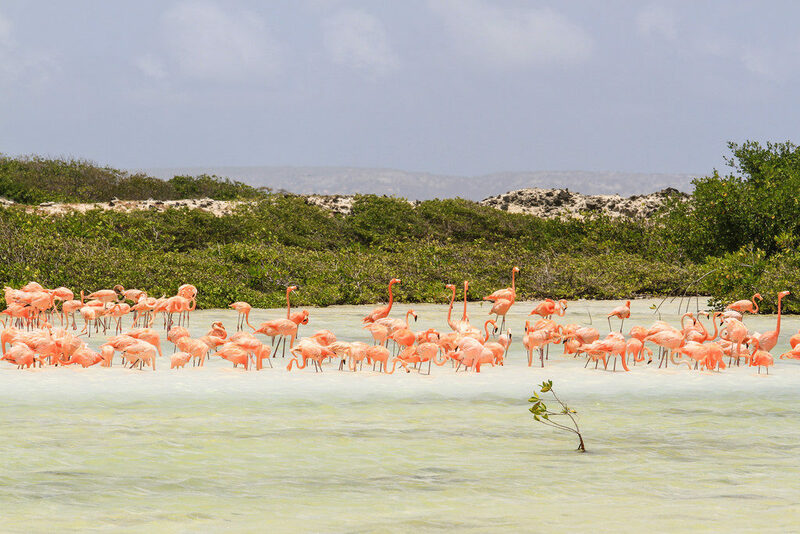 The salt pans on the tiny island of Bonaire are one of only four places in the world where flamingos breed. South of Kralendijk, you’ll find the Pekelmeer Flamingo Sanctuary. As the sea water floods the salt pans, they change color– from pink, to white, to turquoise, depending on the amount of brine shrimp currently present in the water. You cannot approach the flamingos, but nearby Pink Beach is a great place to view them. You can also see many other species of birds that live in the sanctuary, including osprey, cormorants, heron, and frigate birds. Never heard of Bonaire? Read “Why Bonaire is a True Diver’s Paradise” and find out what it has to offer! Who wouldn’t love to see some teeny tiny turtles ambling toward the sea? 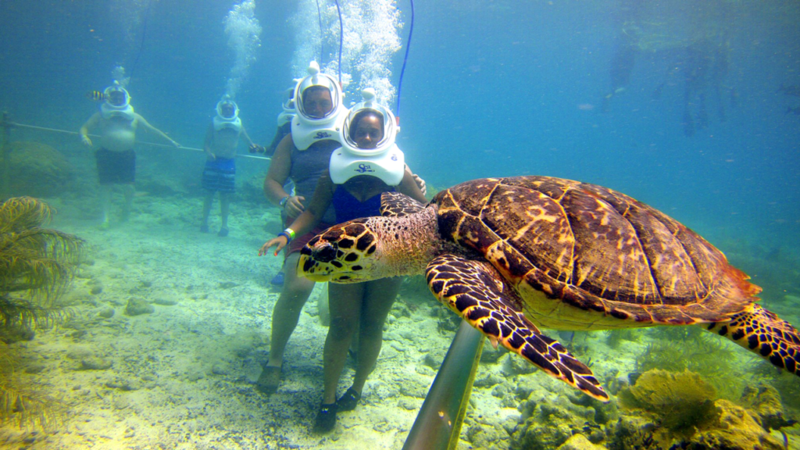 At the Cayman Turtle Centre on Grand Cayman, you can witness a turtle release each year in November. As well as watching young sea turtles take their first steps toward freedom, you can also tour the centre’s facilities to learn about their conversation and rescue efforts. In addition, you can swim with adult turtles, go down a waterslide, and observe other marine species. The Cayman Turtle Centre was founded in 1968, and has since released over 31,000 turtles in the wild. 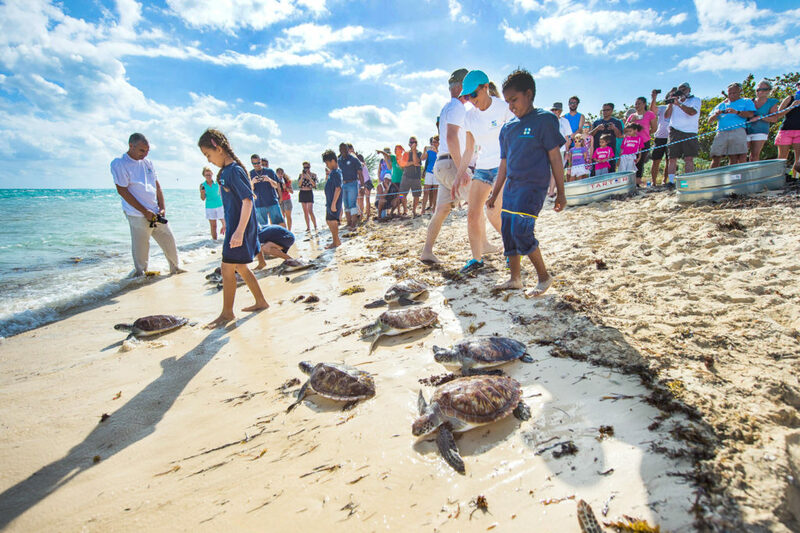 In recent years, the once decimated sea turtle population surrounding Grand Cayman has begun to grow, thanks in part to the Cayman Turtle Centre’s efforts. There’s an island called Gibbs Cay off the coast of Grand Turk (belonging to Turks and Caicos) where you can actually swim with stingrays in a natural environment. Sound strange? Perhaps so, since the name “sting ray” doesn’t actually inspire a sense of safety. However, these majestic sea creatures don’t generally attack humans and they are quite docile. So, be sure to add this one to your bucket list of activities to do in the Caribbean! In some places, stingrays have become extremely used to human contact and hang around them, hoping to receive food. It’s always a good idea to go with a knowledgeable tour guide. Would you swim with stingrays? Let us know in the comment section below!